I've thought about starting this thread for a while now, wasn't sure if anyone would be interested; but I decided to give it a go as sheep farming is something suited to the many different types of land that ZS members either own or would like to. But this isn't just for members who already have a flock but to hopefully give anyone interested an idea of what Sheep farming involves. A ewe with her ram lamb. Texels are farmed primarily for meat rather than dairy produce or wool. A rouge ram lamb on the right of the picture. Rouge are farmed both for dairy and their meat. They have creamy milk and Camembert cheese is often made from this. With both the rouge and texel we breed purebred lambs with the aim of selling these to other breeders. We keep some for our own breeding stock send the rest to an abattoir. I also breed the texel ewe lambs with a rouge ram and sell the cross breed lambs for meat. At this time of year our lambs have been recently weaned off their mothers. We do this once they're around 12 weeks old. The lambs are getting too big to easily suckle, also the ewes milk production dwindles. This was taken the day these lambs were weaned. They were put onto good grass and fed creep feed to supplement their post weaning diet. Creep feed often includes cracked corn, alfalfa, oats and molasses. And also the front access type. The weaned ewes are put onto poor grazing for a fortnight so that their milk supply finishes quickly. It's important to keep an eye out for any ewes that develop Mastitis. Each year we have to prematurely cull ewes that have lost their ability to produce milk due to Mastitis. It's upsetting and wasteful to do so. We treat the mastitis with antibiotics and a good old fashioned mint rub such as UdderMint. At present we are feeding the weaned lambs, keeping an eye on the ewes and putting the rams on a careful diet so that they will be fit for their ladies in the autumn. The next main job will be to dip the sheep. Then it's preparing the lambs to go to market. I'll write up about these and share pics after I do them. Mr. E. Monkey wrote: Wee drop is NOT a dinosaur with a mind-control hat. Wee drop is NOT a dinosaur with a mind-control hat. airballrad wrote: All hail Wee Drop, the Angel of Quittin' Time. The deeper you go in the forest the more things there are to eat your horse. - You need to get a few of these. Bon they'd certainly be a first for this area. They're probably a multipurpose sheep like our rouge. The horns would look great on a shepherds crook. Those ^ are an example of the Texel x Rouge sheep we breed. How do you dip a sheep? There's still some old concrete or cobble-stone dipping vats around here that the farmers used for their cows. Rick we use a spray system which drenches the sheep with the dip. Sheep can drown in the traditional 6' dip troughs when they panic and climb over each other. They still don't like this method but they aren't in danger of drowning. wee drop o' bush wrote: Sheep can drown in the traditional 6' dip troughs when they panic and climb over each other. They still don't like this method but they aren't in danger of drowning. Okay, I'm in. My wife and I raise Kathahdins in Central Kentucky. Actually, she's raising them now, I'm in Afghanistan. We feed nothing but grass and supplement with mineral blocks. The Katahdins have done well on grass health-wise, but obviously they take longer to get to market weight; the local sweet spot is 90-110 pounds. The only doctoring we do is to worm twice a year. Basically, we're lazy farmers. Make sure they've got water and try to keep the coyotes away. Here's Mrs. KYZhunters with two babies having a hard time keeping up with the big kids. 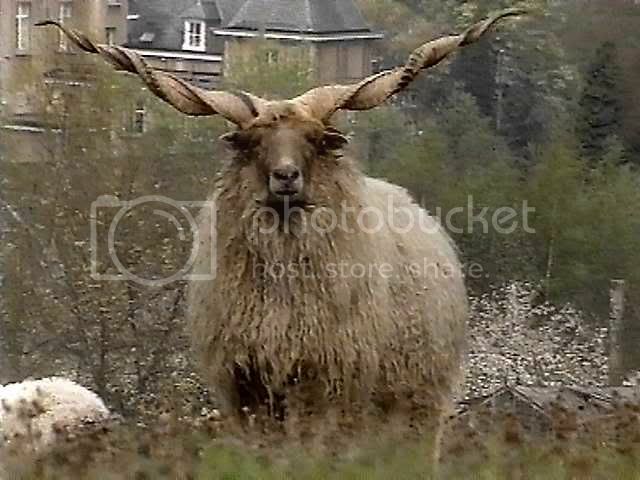 Hi KYZ, I've not heard of the sheep breed you keep so I googled them. They're a meat breed like our Texels and I like the way they don't need shorn or tailed as lambs. They sound ideal for your location, and for thriving on no meal. Ok so the lambs are taking longer to make the weight but I bet they'll produce a superior meat. We don't over feed our lambs but we don't have a huge amount of land so we have to stretch out the time they graze in each field. Feeding them allows the next field time enough to recover its grass sward. This is wonderful wee! Thank you! Why do some breeds need to be "tailed"? Also, why do sheep need to be bathed, whether in troughs or the big shower? 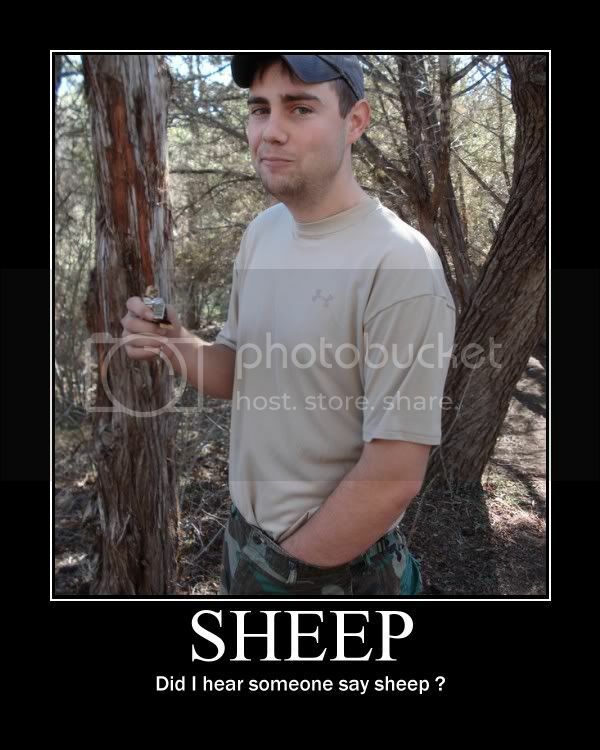 Wee, do y'all ever de-horn the sheep? I helped my Grandfather de-horn his kids when he had a few milk goats......I think it was more unpleasant for me, than it was for the goats. Anianna wrote: Also, why do sheep need to be bathed, whether in troughs or the big shower? There's usually an insecticide and fungicide mixed in with the water, that helps keep the parasites off of the livestock. NoAm wrote: This is wonderful wee! Thank you! Ani you tail sheep to prevent fly strike. Often the longer a tail is the greater surface area there is for dung to gather. Flies lay their eggs on the tail, which hatch into maggots that eat the flesh around their hatch site. It really is disgusting to pick maggots out of an infected sheep, also it causes them suffering. Our lambs are tailed at around 5 days old. There are three main ways to tail lambs: to cut the tails off, cauterising the tails with a hot iron or to use a small ring which constricts the blood supply so the tail withers and falls off. We use the tailing rings which are placed around the lambs tail. It is sore for the first while but then the tail starts to deaden and the discomfort eases, usually within a day. The benefits for the sheep out way the pain. We dip sheep to also prevent fly strike. Sheep dip is a liquid pesticide which helps destroy and protect against infestation of ectoparasites such as scabies, ticks and lice. RickOShea wrote: Wee, do y'all ever de-horn the sheep? The few that grew horns anyway had to get them sawed off. Which was unpleasant for all involved. Favorite Zombie Movies: Well, your mum rang about you going round tomorrow night, and then Liz rang about the two of you eating out tonight, and then your mum rang back to see if I wanted to eat her out tonight. KEEPER OF THE MEATWORLD SPICEWEASEL. JoergS wrote: The power of 30 English longbowmen, at your fingertips... sweet. Vicarious_Lee wrote: I have boners in places I didn't even know I had dicks. Oneswunk wrote: Northern Irish entertainment center? I've considered adding a few sheep to the proposed farm's lineup, adding them to the goats. History class taught me that sheep eat the grass right down to the dirt, hence the cattle wars in the US west. Do sheep eat the grass down that far as a matter of course, or only if there's a shortage of edible grass? How much area does a single sheep need for grazing/day? If I put goats with sheep in the same area, will the goats browse brush while the sheep eat grass, or will there be competition? silentpoet wrote: My first two warning shots are aimed center of mass. If that don't warn them I fire warning shots at their head until they are warned enough that I am no longer in fear for my life. The one Grandfather had looked like a small ice cream scooper with a power cord attached to the end. When you plugged it in and turned it on, the scooper part got hot enough to cauterize as you "scooped" the little horn knobs out. KnightoftheRoc wrote: I've considered adding a few sheep to the proposed farm's lineup, adding them to the goats. History class taught me that sheep eat the grass right down to the dirt, hence the cattle wars in the US west. Do sheep eat the grass down that far as a matter of course, or only if there's a shortage of edible grass? How much area does a single sheep need for grazing/day? If I put goats with sheep in the same area, will the goats browse brush while the sheep eat grass, or will there be competition? KotR our sheep love the tender stems of grass close to the ground...grass can get too long for their liking. They will literally eat to the dirt if they are hungered though. Sheep will browse brush too, in fact they love low hanging branches of trees and will climb and/or stretch to eat the leaves. They particularly love Ivy & grazing along hedgerows. I don't own goats so I'm unsure how they eat together but there's competition between sheep for food anyway. I imagine they would mostly keep to themselves but could coexist peacefully. In short sheep do eat grass of course but also love to eat amongst hedgerows. As to how much area each sheep needs, this depends upon what else they are fed, the weight of the sheep, whether they are nursing lambs etc. This article gives some idea of guidelines. A rough guideline we follow is two sheep to an acre of land per year. If fertiliser is sown you can graze 4 to an acre. Those are for tails? We use them on their testicles!